The Cobb County Department of Transportation (CCDOT) and the Town Center Community Improvement District (TCCID) propose to widen, realign, and extend Shiloh Valley Drive/Greers Chapel Drive across Interstate 75 (I-75) to a widened Roberts Court to form a continuous road approximately 0.3 mile south of Ernest Barrett Parkway/State Route (SR) 5 (Barrett Parkway) (see Figure 1). The total project length is approximately 0.9 mile. The purpose of this project is to provide congestion and mobility relief and improve motorist safety in the vicinity of I-75 at Barrett Parkway. This project is needed because high levels of congestion (resulting in poor levels of service and reduced travel times), as well as high crash rates are experienced along Barrett Parkway in the vicinity of I-75. 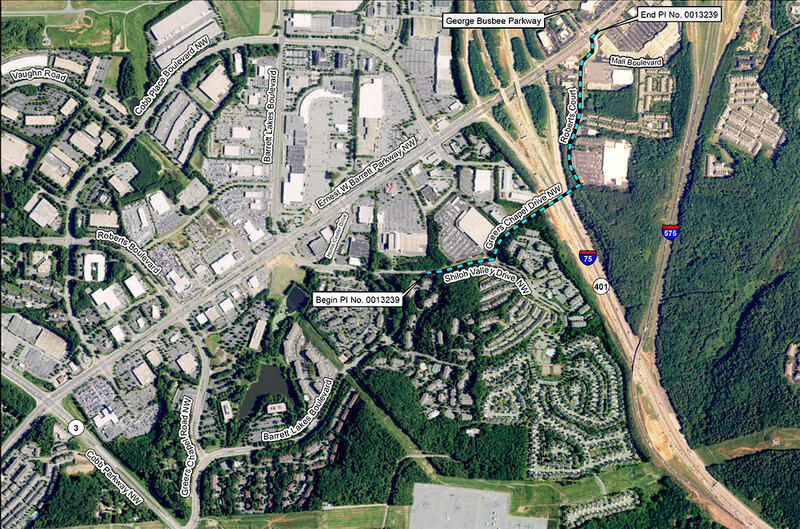 As an ancillary benefit, the project would provide additional access to some commercial and retail businesses and apartment complexes along Shiloh Valley Drive, Greers Chapel Drive, and Roberts Court. To learn more, please download the complete Environmental Assessment (PDF, 28 MB) or the proposed project map (PDF, 1.8 MB).